That's a lot safer than testing it on real world streets. Where does an autonomous car (AV) go to driving school? So far, most testing has taken place on real-world streets, which has led to accidents and even deaths. Now Wayve — a team of researchers from Cambridge University developing artificial intelligence software for AVs — might have a much safer approach: they successfully taught a self-driving car how to drive exclusively using a simulation. In a demo, Wayve touts its Sim2Real project as being “the first time” that’s ever been done successfully. Wayve’s Sim2Real project takes a complex driving simulation inspired by real life — think of it as a basic, and terrible-looking video game — and teaches it to a self-driving car’s AI. 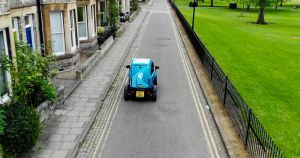 Voila: Wayve’s car now knows how to drive on the real-life streets of Cambridge in the UK — without ever having driven them before. It’s like that scene in “The Matrix” where they download kung fu into Neo’s brain, except in this case, Neo is an AI. The driving model essentially fills in the gaps from what it has learned inside the simulation. It overlays what it has learned over data captured while driving down a real street, essentially aligning the ‘matrix’ over the real world. Wayve’s car drove itself for 1.9 miles (3 km) so far. But it has a lot more to learn about driving in the real world. At the end of the day, reality is far more complex than a simplistic driving simulation. Pedestrians or cyclists could complicate matters, for instance. But it’s an interesting solution to a very real problem: testing autonomous vehicles — even with a safety driver behind the wheel — is proving to be pretty dangerous. Wayve’s solution could buy developers a little more time before AVs hit the roads for good — and smooth the transition to self-driving in the process.